Peru is an interesting country on the western side of Central America. It is interesting because of so many places to visit in Peru such as archeological sites, Inca ruins, beaches and the fact that 13% of the Amazon lies within its borders, offering tourists to Peru a diverse vacation destination steeped in history and topographic wonders. 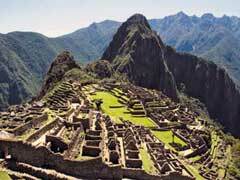 Machu Picchu is perhaps one of the most famous sites for ruins in the entire world. Located near the present day city of Cusco, they are situated in the middle of a cloud forest and once served as the Inca Citadel. Tourists today can witness the intricate carvings, steps and canals of the ancient Incas when they explore the two zones of the site, the agricultural where food storage houses and terraces used to be and the urban zone, the old home of the sacred sector, including temples, squares and royal tombs. The Inca Trail is part of one of the world’s most famous hiking trails and is said to be one of the most spectacular walks in all of the Americas. Travelers to Peru can spend a few days hiking the 43 km stone paved trail walking through varied climates and ecosystems along the way. The Sacred Valley of the Incas is located on the way to Machu Picchu and includes many Inca sites, villages and beautiful scenery that stretch for miles. Llamas, pumas and many varieties of birds call this area home. The Cusco Historic Center features architecture and perfectly maintained gardens along with walking areas, silver jewelry, colonial churches, cathedrals, shops and Peruvian food all in close proximity to many Inca settlements. 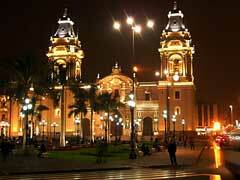 Lima is the capital city and offers Peru’s tourists lots of culture, history and places of interest. Founded in 1532, Lima is the gateway to the country as it boasts the only airport. The Historic City Center is a World Heritage Site and includes the cathedral, the main square, the San Francisco church and monastery, the presidential palace and the Museum of Religious Art as well as catacombs. Because the country is rich in archeological discoveries, travelers to Peru have the opportunity to see the history and culture of many ancient civilizations when they tour the National Museum of Archeology, Anthropology and History. On display are artifacts like pottery, metalwork and carvings made by pre-Hispanic cultures indigenous to the area. A tour of Lobos Del Callao takes vacationers into Lima’s harbor where sea lions and penguins live. The rock formations and the wildlife make this a great trip out by boat to see the sights and nice views of the historic city. Iquitos is a city close to the Amazon rainforest so it is no wonder that tours into the jungle take place from there. Travelers to Peru can take tours that allow them to live in the jungle for days at a time, canoeing or hiking along to different villages where you get to experience a day in the life of the residents. Sleep in a tree platform, take night canoe rides, and experience all the interesting animals, birds and plants that you just can’t see anywhere but the Amazon. The Amazon Refuge Wildlife Conservation Area is a place where you can get up close to the Amazon’s animals without spending days searching for them in the actual jungle. Here, animals are allowed to just be in the wild and those traveling in Peru go to get to know them on a more personal level. Snakes, sloths, monkeys and deer all call the reserve home as do marine mammals like the famous pink river dolphin and many varieties of fish. Close to Iquitos is the floating village of Belen, which boasts a huge market with all of the local vendors peddling their wares. Travelers here can take a boat ride through the village that gets flooded year after year, hence the floating houses that go with the flow of the tide. The Nazca Lines are a phenomenon that is a great attraction for Peru tourism. Located in the Nazca Desert in southern Peru, these ancient geoglyphs are scratched into the earth and have remained intact for centuries. The lines cover 450 sq. km. and are an expression of the Nazca civilization. The best way to see them is to fly over them in a plane because they are so large, but there are also observation towers that offer views as well. Some are just lines while others are pictures of animals and insects but they all make a fascinating attraction that is both mysterious and wondrous. 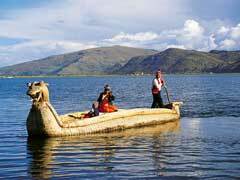 Near the city of Puno is the Lake Titicaca, the largest lake by volume in South America. Here is home to the famous floating islands that are made out of floating reeds. The lake offers mountain views of the Andes and a look back in time as it were as no machines are allowed on the islands, meaning everything has to be done by hand. Peru tourism has it all: diverse topography, historical relevance and a long archeological tradition that preserves its lost civilizations that all working in concert, make it the ideal vacation destination.